How will this partnership benefit you? Arthritis Consumer Experts (ACE) and the Arthritis Research Centre of Canada (ARC) have entered a three year partnership with Shoppers Drug Mart/Pharmaprix ("Shoppers"), which will make a significant difference in the lives of individuals and families living with arthritis. Through the partnership, pharmacists at more than 1,200 Shoppers stores across Canada will be providing valuable and easily accessible information and tools on arthritis prevention, detection and screening, treatment and research information to help millions of Canadians better understand arthritis. The initiative was announced at a launch event in Toronto, attended by Federal Minister of Health Rona Ambrose; Canadian Institutes of Health Research Chief Scientific Officer and Vice President, Dr. Jane Aubin; Shoppers Drug Mart Chief Executive Officer and President, Domenic Pilla; as well as ACE and ARC executives. It means that consumers will be able to participate in personal consultations with pharmacists at Canada’s largest retail drug store, using the tools developed through the partnership, to help practice prevention, detect or manage arthritis. During a consultation, the pharmacist reviews the data from a self-administered screening exam, along with other health information to provide appropriate, personalized recommendations based on the latest research. In preparation for the partnership launch, ACE and ARC helped produce specifically designed tools to assist pharmacists at participating Shoppers Drug Mart stores to consult with consumers about their personal risk for arthritis and give recommendations for prevention and treatment. A cost-effective, scientifically proven, high sensitivity questionnaire for pharmacists to help identify in their customers early undiagnosed osteoarthritis of the knee. Validated letter for informing primary care physicians of knee osteoarthritis diagnosis, along with results of the medication review. Scientifically tested, evidence-based medication review for pain medications and the possible risk of gastrointestinal side effects. Arthritis screening tool for in-store pharmacy use to assist customers to self-screen for possible osteoarthritis or rheumatoid arthritis using the latest classification criteria of the American College of Rheumatology and the Canadian Rheumatology Association and seek additional information from their pharmacist. Additionally, together with Shoppers Drug Mart, ACE and ARC produced online versions of the Arthritis Screening Tool, one for men at bit.ly/1bbjWHw and one tailored for women at bit.ly/15eXHwK. These invaluable online tools help consumers detect possible arthritis, therefore potentially preventing or delaying the onset of arthritis or the damage caused by it. As Canada’s largest pharmacy chain, Shoppers Drug Mart is able to deliver these health support programs on a national scale, offering more potential points of access than any other pharmacy services provider in the country. Consulting regularly with your healthcare team, including your doctor and pharmacist, is important for protecting your specific arthritis health issues. Physicians have the details of your medical history and the training to make a diagnosis and decision about your arthritis treatment. Pharmacists are also able to monitor medications for efficacy and safety and can follow up with patients to make sure that the medications are used and working as intended. Finally, pharmacy services are fast becoming an important part of healthcare reform in Canada. In some provinces, pharmacists now have the ability to assist physicians with prescription renewals, and where appropriate and necessary, adjust prescriptions dosages and administer vaccines, saving patients both time and energy in making multiple trips to their physicians’ offices. If you live with arthritis, you probably spend a great deal of time with many different health professionals: a family physician, rheumatologist, pharmacist, physiotherapist, occupational therapist, orthopedic surgeon, or dietician. So, think of yourself as the manager of your treatment plan and the person who decides which professionals belong on your arthritis healthcare team. Once you have begun to build your healthcare team, with referrals to these professionals, there are steps you can take to make the most out of the time you spend with the members of your team. If you recently started a new arthritis medication, the Arthritis Screening Tool is also an excellent way to help you and your pharmacist monitor your symptoms and the effectiveness of your treatment. It’s about making sure you get the most benefit from your medication to help prevent the disease from getting worse. Medications are a critical part of a successful arthritis treatment plan. Thankfully, new advances in medication treatments have expanded the options available to people living with arthritis. Decisions around medications, however, can be very difficult to make. Getting all the facts about the medication choices available to you will help you to feel more comfortable and confident in your decision. Pharmacists are experts in what makes up a medication and how it is supposed to work in the body. They can provide specific information on things to look for, such as whether the medication is actually working, if it is causing harm, how to take it, when to take it, and what happens if a dose is missed. Research shows that longer life expectancy, hormones and lifestyle differences may explain the higher prevalence in women. Women with the disease also report more disability than men. At work, arthritis is the most frequently mentioned condition as a cause of disability among Canadian women. A 2013 Vision Critical National Survey commissioned by ACE, ARC, and Shoppers Drug Mart of more than 1,000 women living with arthritis found that Canadian women identify health and wellness as their top life priority but do not feel they have easy access to vital, life-saving arthritis facts about screening, signs and symptoms, treatment and what they can do on a daily basis to protect their joints and manage pain. According to the survey, the most important issues for respondents were decreasing stiffness and damage in joints, and knowing how to decrease and manage pain. More than half of the women also said their current health status limits them in vigorous activities, such as running, climbing stairs, lifting heavy objects, and participating in sports. As part of their partnership, ACE and ARC worked with Shoppers Drug Mart to develop their WOMEN: Body, Mind, Spirit initiative, an arthritis program specifically for women living with the disease. A key part of the program is to equip pharmacists with tools and advice to help women assess their joint health to prevent and manage arthritis. We have specifically designed the Women’s Arthritis Health Guide to make arthritis health accessible and personalized for women when and where they need it. Arthritis 101: What is arthritis? Why is the disease more prevalent among women? What role can certain exercises, like yoga or Pilates, and nutrition play in managing joint stiffness, pain and controlling the disease? Prime Time: The effect of arthritis on young women when it comes to their sexual relationships, career, and family aspirations. Mom & Boss: The impact of arthritis on a woman’s ability to parent and climb the corporate ladder. Learn how women with arthritis can juggle both. The diagnosis of arthritis for a woman can be serious and should not be taken lightly. Early diagnosis and treatment are vital for women dealing with almost every type of arthritis. A correct diagnosis is the first step toward taking control of arthritis, and then action in the form of a treatment plan can be followed. To help women understand their personal risk of arthritis, ACE and ARC have collaborated with Shoppers Drug Mart to develop the first and only arthritis screening program in Canada designed specifically for women: the Women’s Arthritis Screening Tool. The program also helps women with the disease and their pharmacist monitor their symptoms and medication over time to help prevent the disease from worsening. Together with their pharmacist, women are guided through a joint exam and questionnaire to assess their risk of arthritis. If more information or treatment is needed, the pharmacist can then refer her to the most appropriate healthcare provider (e.g., doctor, physiotherapist, occupational therapist or dietician). At participating Shoppers Drug Mart stores, go through the Women’s Arthritis Screening Tool, a joint exam and questionnaire, with a Shoppers Drug Mart pharmacist to learn whether that persistent pain in your knee is a form of arthritis or just a lingering injury. The Women’s Arthritis Screening Tool is the first and only arthritis screening program in Canada designed specifically for women. 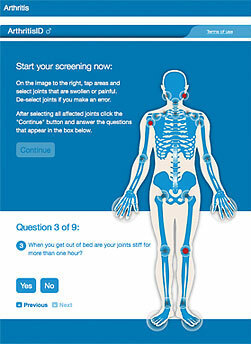 ACE and ARC also worked with Shoppers Drug Mart to produce an online version of the Women's Arthritis Screening Tool to help women prevent or delay the onset of arthritis. An interactive joint exam and questionnaire, the Women’s Arthritis Screening Tool will analyze your responses and provide you valuable results to help detect arthritis, track symptoms, and provide information to manage your type of arthritis. 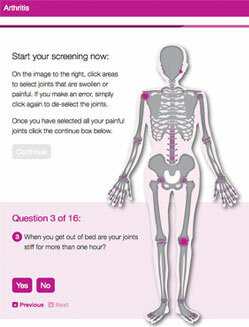 Once diagnosed, the online screening tool can be used to help a woman monitor her arthritis. She can go back in to assess certain joints and provide results to her doctor for further follow-up. If you think you have arthritis or are experiencing joint pain, take your personalized screening today at bit.ly/15eXHwK. Over the past 12 months, ACE received unrestricted grants-in-aid from: AbbVie Corporation, Amgen Canada, Arthritis Research Centre of Canada, Bristol-Myers Squibb Canada, Canadian Institutes of Health Research, GlaxoSmithKline, Hoffman-La Roche Canada Ltd., Janssen Inc., Pfizer Canada and Takeda Canada, Inc. ACE also receives unsolicited donations from its community members (people with arthritis) across Canada.